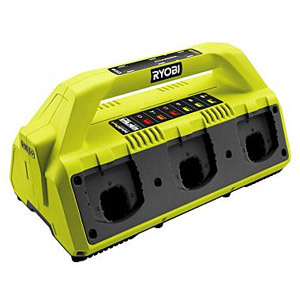 NEW Ryobi Six Port Battery charger. Suitable for charging 18 volt One Plus Lithium-Ion Batteries. The RC18627 supersedes the previously popular Ryobi BCS618 six port charger. Please be aware this charger will NOT charge the older style NiCad batteries. It only contains the lithium battery technology. Maintenance station - batteries stored on charger are conditioned for peak performance. Electronic feedback shows status of each battery; charging, charged, error.